Across the country, many communities have called for establishing ordinanced entities outside of the police department to play a role in promoting police accountability. These bodies can go by a variety of names, including police commissions and civilian review boards (CRBs), but many share the same basic goal: to provide a formal way for community members to play a role in how their community is policed. There are a great many of these entities across the country. However, our research found, in practice, many of these bodies have little actual authority when it comes to effecting real change in police policy and procedure. In our latest report, we sought to understand the scope and actual authority of external oversight entities. For this work, we surveyed the 100 largest municipal police departments based on total number of sworn officers, according to the Uniform Crime Reporting program. For the purposes of this study, we focused on external entities that were established through municipal, county or state laws, not groups that were created by the police departments themselves. Our study found 76 of the top 100 police departments have at least one external, ordinanced oversight entity. However, the actual authority of these entities varied widely. Of the 76 cities with established external review bodies, 19 grant no actual policy authority to these entities. 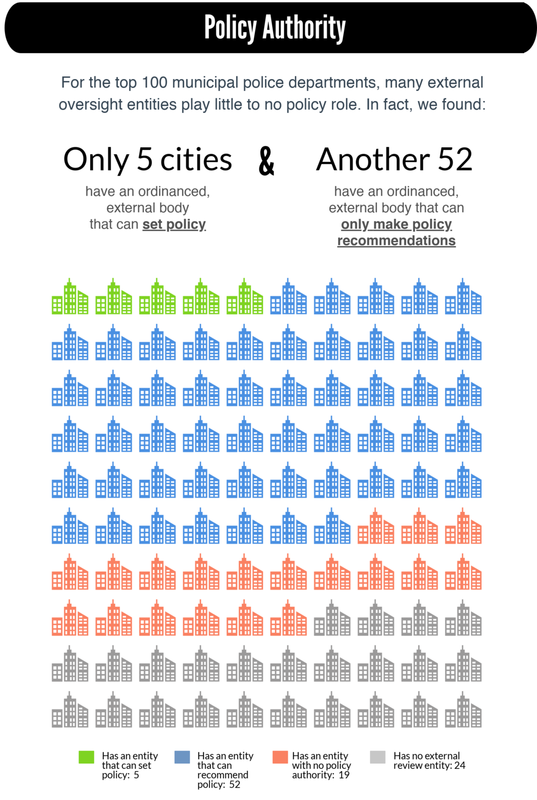 In 52 cities we surveyed, an external review entity only has the authority to recommend policy actions. Significantly fewer cities have an entity with the authority to enact policy change. In fact, only 5 in our survey — Los Angeles, Detroit, San Francisco, Milwaukee, and Kansas City — had a body that can directly set front-end policing policies, such as those that govern officer conduct. An external oversight entity can also influence police policy indirectly through selection or removal of the head of the police department. But very few cities in our survey have authorized this power for civilian-led review entities. Of the 100 cities we surveyed, only Chicago, Detroit, Los Angeles, and San Francisco have an external entity that can nominate or provide a shortlist of police chief candidates to the mayor for appointment. Only in Honolulu, Kansas City, Madison, and Milwaukee can an external review body directly appoint a new chief. The ability to remove the head of the police department was similarly limited. Only in 7 cities —Honolulu, Kansas City, Madison, Milwaukee, Oakland, Los Angeles, and San Francisco— can an external review body remove the police chief, though in some cases this action could be carried out only with mayoral or city council approval. The mission of the Policing Project is to empower the public's voice on policing on the front end—for policing agencies and communities to work collaboratively to identify public safety priorities and to decide, together, how the community should be policed. As calls for the creation of police commissions, CRBs, and other external review groups increase across the country, our survey shows that special attention should be paid to the actual authority of these groups. Real front-end accountability enables the public to participate in decisions about policing. But simply establishing a civilian oversight entity does not guarantee that the community will have that substantive voice. There is no one-size-fits-all when it comes to front-end accountability or civilian oversight. Each community will need to have their own informed conversation and find the approach that works best for them. We hope that by exploring how different cities have approached this issue — and by highlighting both the strengths and limitations of existing review bodies — this report will serve to foster this dialogue. Research for this report was prepared by Policing Project externs Zeinab Hussen, Cynthia Long, Nathalie Herrand and Julia Schuurman. See something we missed or know of changes to community oversight in your city? Contact us and let us know.